A Michigan church wins $70,000 in the state lottery. The Covenant Life Worship Center in Haslett, Michigan cashed in a second-prize ticket for a nice, tax-exempt payoff for the congregation. That is correct. Since a non-profit organization won the prize they will not be expected to pay any taxes on the winnings. The 25 member church plans to distribute the money to the church building fund, a missionary fund, supporting local community service projects, and I'm sure to host a "pot blessing." 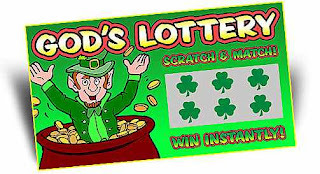 Since giving has been down in this recession, Church finance boards around the country are looking at their budgets deciding how much money they can allocate to purchasing state lottery tickets and rallying the church intercessors to be praying for lotto victory. What will you do with your tithes? Don’t Let Your Pets be Left Behind Alone! What Computer Would Jesus Use?